My wife picked up a 12-pack of these cheaply from Amazon a few weeks back. As we generally do with stationery supplies, she shared a pen with me. I immediately took it with me to work and put it through the ringer. My results are reported below. 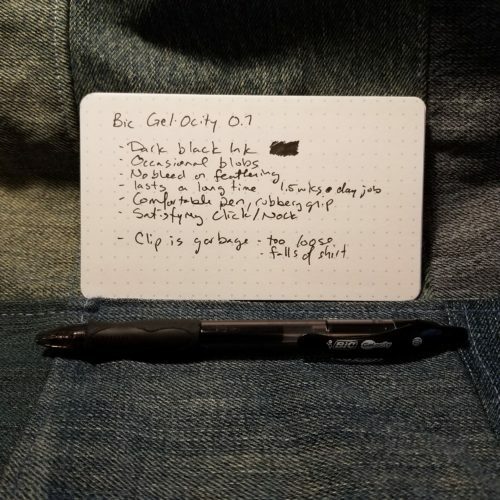 As I’ve shared before a gel pen that lasts more than a week at my DayJob is a winner, the Bic Gelocity lasted for a week and a half. The ink flow is smooth and consistent without skipping. I did find that I’d get a blob here and there when I’d filled out a full page of forms. Blobbing was minimal and didn’t smear. I suspect the few moments of blobs would make this a non-starter for lefties. The ink does dry very quickly, within a second or two on the cheap work paper and a little longer on better paper. I found the black ink nice and dark. I have not tested it for lightfastness. I did a wash of water over some lines and there was minimal lifting. With a longer dry period, there was no lifting of the pigment. As a result, this could be a contender for a great sketching pen for urban sketching. I found the contoured rubber grip to be comfortable. The pen design itself is pretty benign looking reminding me of many other retractable pens- from the Zebra Sarasa to the Pilot G2. The clip design is useless. After a day of use, it was falling off the placket of my shirt, falling into my shirt and onto the floor. Annoying on many levels. An attempt to bend the clip back into a tighter configuration saw the brittle plastic snap. Even more annoying. Overall, this is a great pen if you are working on an absolute shite paper at your workplace. 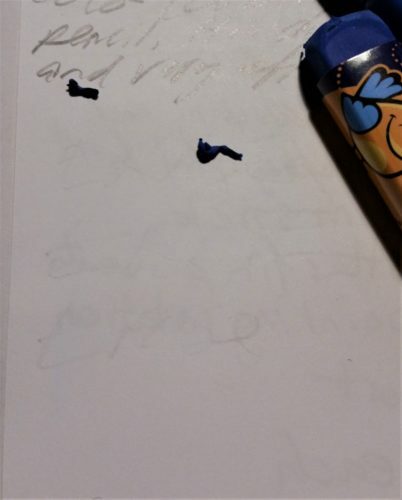 The ink doesn’t sink super deep into the page, but it also doesn’t smudge once you write. The black is deeply dark and photocopies and scans like a champ. The nice flow means you can doodle for days and not feel like you are running out of ink. The refill absolutely drains to the last drop too. This is a great pen for cheap paper and doodling. You can find them at Target, Amazon and other retailers. This entry was posted in Review and tagged BIC, gel, gelocity on 20180726 by leslie. I picked these up for a mere $7 from the Staples clearance rack. I purchased based on seeing the name Conte on the package. The tin is gorgeously printed- the spiral coloring page on the top cover is great. 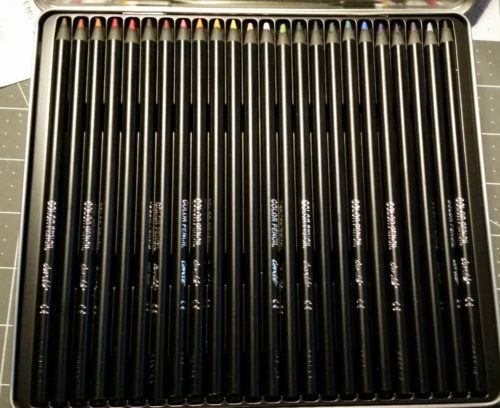 The lid fits very snug and holds the pencils very tightly into their plastic tray. Opening the tin the pencils are gorgeous- black with black “wood” (we’ll get to that in a bit.) And vibrantly colored cores. The printing is silver foil and looks great. Each is simply labeled “coloring pencil” and Conte. The color selection is weird. 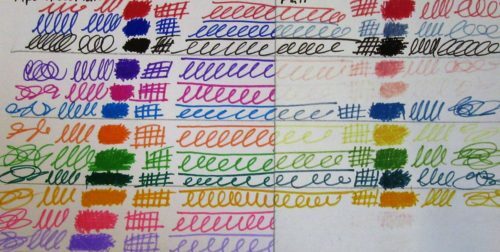 There are five shades of red, 3 shades of brown, five shades of green, three blue, two purple plus white, grey and black. the cores are very smooth but also very hard. It takes a lot of pressure to get a dark line. They are anything but creamy. They layer and blend well and are nice on rough paper. One smooth paper they are terrible. The “wood” part of the pencil is not wood but a foamy extruded garbage. 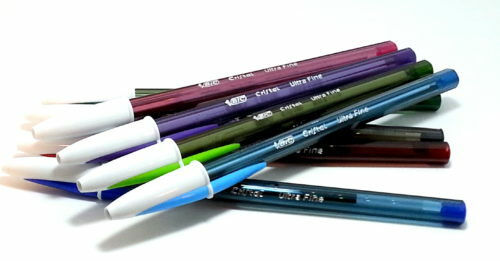 * In use this allows the pencils to bend, especially when using pressure to apply a darker line, they bend in the hand. It’s quite unpleasant. I suppose this is where the Bic part of the arrangement comes in, the extruded garbage reminds me of the Bic Xtra fun pencils. Nasty. This entry was posted in Review and tagged BIC, colored pencils, coloring, conte, garbage on 20170208 by leslie. I picked it up in the hope that the lead inside is the same as the Bic disposable mechanical but thicker. I wasn’t disappointed. It was dark and smooth for an HB. I quite like the lead. 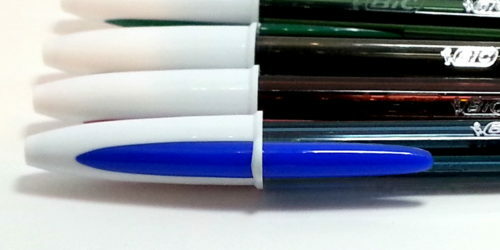 The pencil includes 3 leads inside and the little double ended tube holds 6 more. 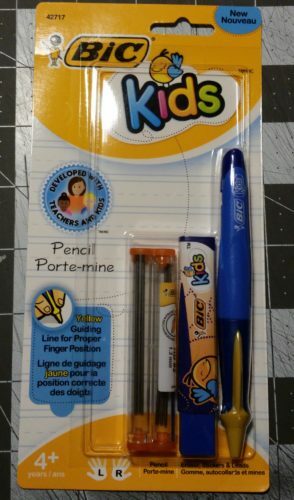 The bad thing about this pencil is that leads are not sold separately, so you can not refill them once you finish your 9 included leads. So that’s a bummer. The pencil is tiny, one of the other reason I purchased it, thinking it would make an excellent pocket mechanical. And it is. It fits perfectly into a pocket. For people with large or even medium sized hand, this is going to be much too small to be usable. It is also very lightweight. That said the finger fitting fin is a pain in thumb. 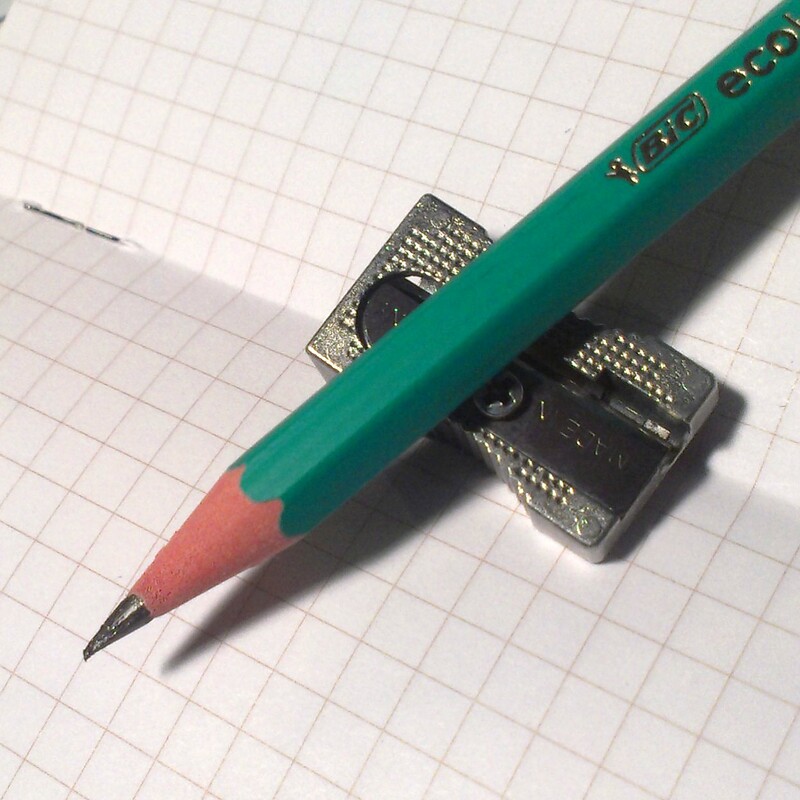 With a pencil you need to rotate it to keep it pointed. the fin prevents you from doing so. So I cut it off. Sow and carefully I used a knife to shave off the fin. This allows me to rotate the pencil to keep the point, pointy. 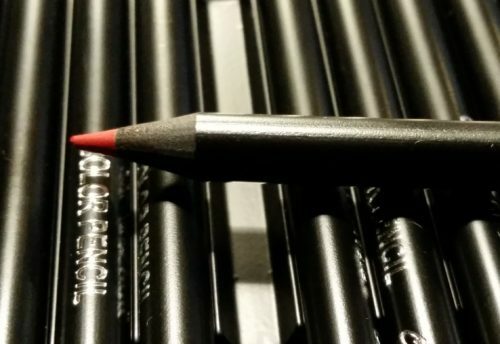 Without the fin the pencil is very comfortable and even enjoyable to use. The included eraser is color coordinated to look good with the pencil. The blue eraser is a nice dark blue, while the pink eraser looks like bubblegum. 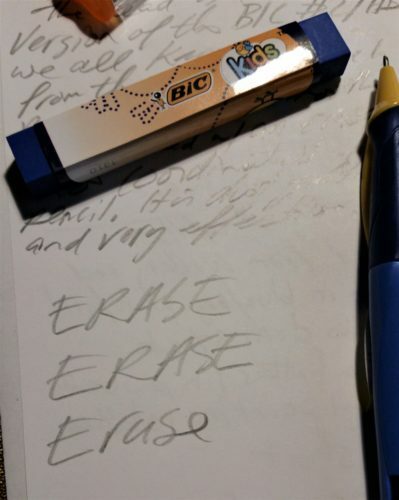 The eraser is dust gathering so all the crumbs clump together and make it easy to clean your page. The Eraser also works really well and cleans the graphite entirely off the page. It is very soft and will be quickly used up. Overall this is a fun little mechanical pencil that is limited by the finger fitting fin and its diminutive size. 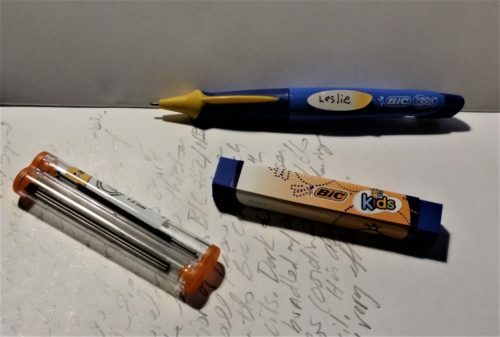 This entry was posted in Review and tagged #2, BIC, HB, kids, mechanical, tiny on 20170206 by leslie. A month ago I created some samples of art and writing materials to see if their pigments were lightfast or fugitive. I’ve checked them here and there throughout the month to see which pens fared the worst. There were some surprises and with other expectations were met. Let’s start with lightfast expectations met. 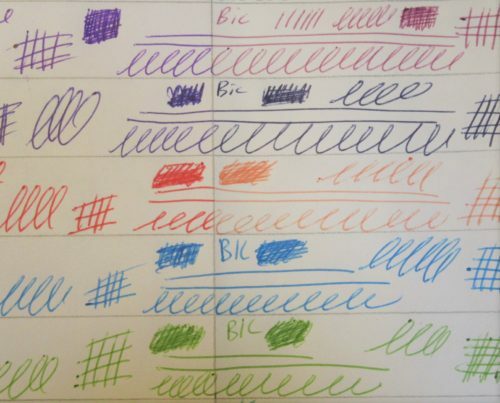 The Uniball and Zebra pens all proved to be lightfast. This was expected, every Uni pen I’ve ever tested has been lightfast. In this case I tested the Air and Jetstream 3.0. I also tested the Zebra Surari 3 and Sarasa 3, both were lightfast. The lightfast surprise was that all of the highlighter pencils did not fade, at all. 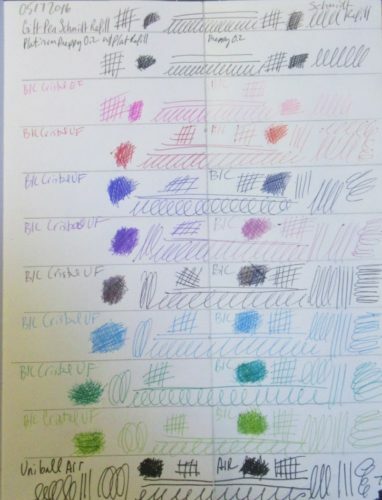 I tested all shades of the Yoobi, Very Best, Koh-i-Noor Dry Marker, as well as the Koh-i-Noor MagixFX series. None of the colors shifted, changed or faded. Quite amazing given that the general rule is that highlighter and neon colors shift. For fugitive properties I expected that all of the Bic colors would fade or shift within a short period of time. Most met this expectation in both tip sizes. Purple, red and pink all shifted in a week and at the end of the month we’re extremely faded. I have no doubt that if I were to continue with the experiment these colors would be gone in months. Blue and Black had noticeably shifted in shade and begin fading at the end of the month, with the black fading the most. 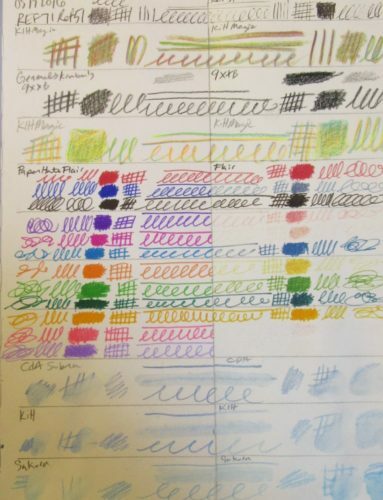 Interestingly light blue, light green and dark green exhibited the least amount of color shift and fading. I would not suggest that these 3 colors are lightfast merely that they did not shift as much as the other colors. 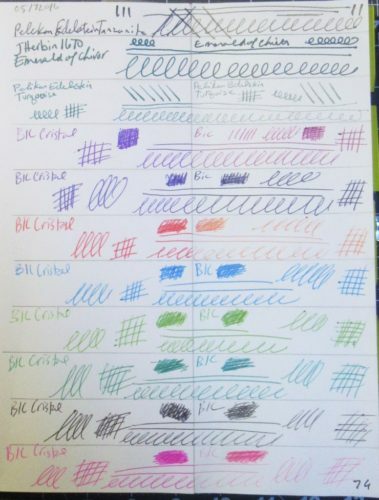 I also expected that the 4 fountain pen inks I tested would show fading and color shifting. There was no surprise here. Both Edelstein shades faded within a week, and by the end of the month the Turquoise was on it’s way to being gone and Tanzanite had only the black left behind. Emerald of Chivor had shifted shade noticeably and was showing signs of fading. Interestingly of the fountain pen inks tested only one was lightfast, the Platinum Preppy black cartridge used in an EF Preppy pen. I tested 2 ballpoint pens- the Retro 51 REF71 (a Schmidt refill) and a Schmidt mini refill. Both proved to be fugitive but still easy to read at the end of the month. The black ink was quite faded. Finally as predicted the Papermate Flairs proved to be incredibly fugitive. They showed rapid color shifting- radical color changes in a week and several colors complete gone from the page at the end of the month. Both shades of purple and pink were gone and no longer at all visible. Yellow and Peach were nearly gone. Red, both shades of blue, black, both shades of green showed fading and massive color shifts at the end of the month. What does all of this mean? 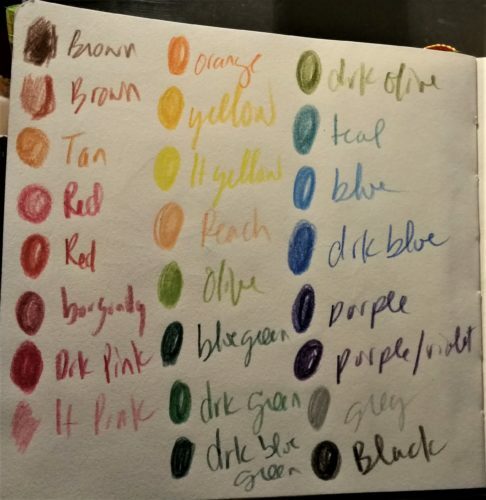 For me, anything that shows color shifting or fading should only be used in an art journal, or something that will not be displayed. Because even artificial light can fade and alter colors it’s not safe to allow work done with these fugitive pigments to be anywhere the sun or light shines. This entry was posted in Review, technique and tagged BIC, flair, fugitive, lightfast, papermate on 20160629 by leslie. 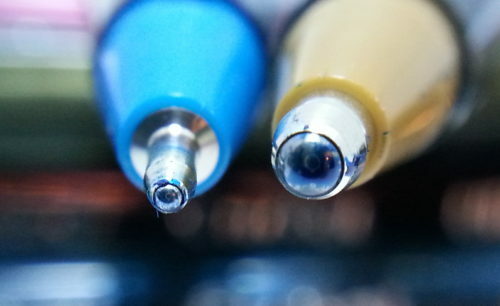 The Bic Cristal seems to be a heavily favored ball point for sketching, drawing, and doodling. 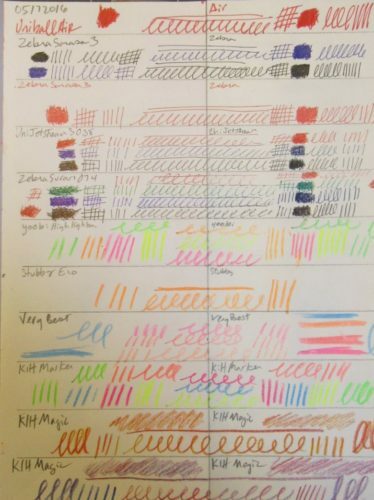 One might wonder why when there are so many “better” options out there for pens. Please keep in mind that this review/discussion is abou the Cristal and NOT the shite Bic Stic. First and foremost, I’ll point out that my strongest belief is that the best tool is the tool you use. If you have a Bic in hand and you feel like drawing, then you should. Bic Cristals are available everywhere. I found them in CVS, Walgreens, target, Staples, Walmart, and every other place I looked. They are also very inexpensive. A 24 pack of mixed colored Xtra Bold were $4 at my local Staples while the 15 pack of Ultra Fine “Precisions” were $3.49 at my local Target. (Calling these two chains local sort of begs the question of what local is- in this case I’m using it to describe a location to which I could, if pressed, ride my bike to in a reasonable amount of time, that is roughly 5 miles from my home. *) For less than $10 I was able to purchase 39 pens in 8 colors and 2 tip sizes for under $10. That is very cheap. Because they are quite inexpensive and easily available everyone knows what they feel like to use. Because of this they do not feel precious. You can use them to your hearts content and not be worried that you are going to use them up, because for another $4 you can get another 24-pack. For the most part, they simply work. 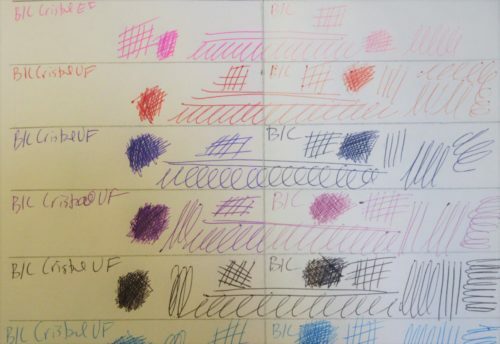 I’ve found that a few of the colors seem to flow more slowly than others, and that the Ultra Fines seem to skip a bit here and there, but that is also useful when sketching or drawing- using a pen with a “rougher” flow can give a bit of character to a sketch that otherwise might be flat and boring. The various colors are all pretty standard. Their core colors are black, dark blue, red, and dark green. The new 4 seem to be part of their “fashion” line up- dark purple, light blue, pink, and light green. The purple, light blue, and pink are okay but the light green is a sick shade of yellow green that borders on the color of bile. Nasty. What makes the Cristal stand out from the Stic is that the Cristal body is hard, while the Stick flexes quite a lot in use. When I was a kid my Bic Stics ALWAYS ended up curved. In some part because I would use them as a worry and bend them as I read, but also because I’d put a lot of pressure on them. The Cristal doesn’t allow for flex. Too much pressure and it will shatter. Unlike the Clic, the Cristal’s point doesn’t flop all over the place as it is used. This makes the Cristal great for sketching, doodles, and drawing. Currently, I’m testing the lightfast abilities of all the Cristals in my possession but I strongly doubt that the majority of the colors are lightfast, if any at all. I suspect that the light green, pink, red, and purple will be gone in a week or 2, and in a month the majority of the other colors, including black, will have shifted in shade substantially. I’ll keep you updated. For the art journaler who uses acrylic in their journal, the Xtra Bold pens have the added bonus of being able to write over acrylic paints. This entry was posted in Review and tagged ballpoint, BIC, cheap, cristal, pens, tools you use on 20160607 by leslie. I picked up a few neat pencils in a trade with PencilRevolution‘s Johnny Gamber. One of those pencils was the BIC ECOlution. Like the Staedtler Wopex, it’s extruded. Unlike the Wopex it is flexible. Similar to the weird flexy extruded pencils of the 90s, you can really bend this pencil as you write. Unlike the weird extruded pencils of the 90s this flexing doesn’t seem to break the core. So though it has bends as I write, it sharpens to a nice point every time. Speaking of sharpening, it has a weird melted plastic smell as I sharpen it. It’s almost a burnt rubber smell. It’s not noticeable except for right after I’ve sharpened the pencil. Like the Wopex, the end tends to chip off. This leaves me with a slightly blunted point. Which is fine for notebooks with larger ruling or sketching, but horrible for college ruled or Field Notes. If I’m more careful as I sharpen the pencil, it doesn’t chip. Let’s face it I don’t use this sort of pencil for sketching. It’s simply too light for anything but very cursory and initial sketching. For writing it’s just fine. In fact I like it quite a bit for writing. It doesn’t smudge in my notebook or when my hand runs over it. This is a great pencil to pair with a Field Notes and Fauxdori style cover. the fact that it doesn’t smudge while your notebook rides in a hip pocket is a fantastic feature. The pencil is a nice bright teal color. One of my favorite colors. the imprint is gold foil, and done very well. The core is well centered. 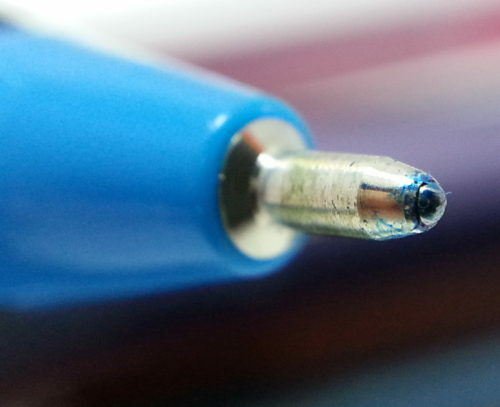 The ferrule is nice shiny silver and attached to the pencil very well. The eraser is a nice white plastic eraser that does a good job on the Ecolution’s core. 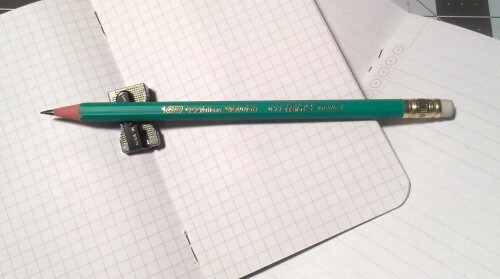 The hard part about this pencil is finding one. The only place you can find one is on eBay and by international sellers. The prices are pretty reasonable, it’s the shipping that kills the deal. This pencil has 3 major downsides- the weird melted plastic smell when sharpened. * It’s bending is something that I find odd in a pencil. 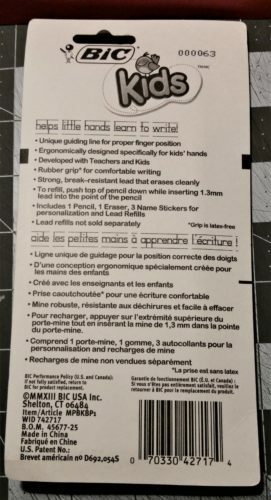 Pencils are supposed to be hard, not bendy. Finally, It’s unavailable on the regular US pencil market and must be found on eBay by international sellers. Even with those downsides, I really like this pencil. This entry was posted in Review and tagged BIC, Eco, ecolution, Europe, evolution, Extruded, pencil on 20140807 by leslie.